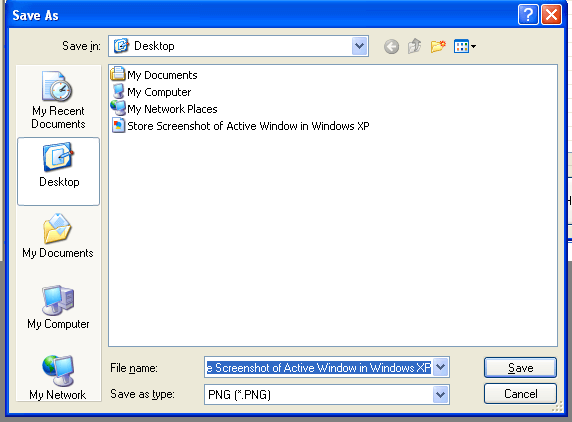 In order to capture Screenshot of a particular Window in Windows XP, you need to press Alt + Prt Scr button while the particular window is active and has focus. The Alt + Prt Scr button press copies screenshot of the focus window to clipboard. Once you have the image of that particular Window in Clipboard, you can use the Ctrl + V command in any Image Editor, Word Document or any other application which allows you to paste image data. The above screenshot displays how to press Alt + Prt Scr button on Keyboard to capture Screenshot of the Window in focus. Note that you need to press the Alt Key on your Keyboard and without releasing it, you need to press the Prt Scr button to capture screenshot of the Active Window in focus. The above Screenshot displays, how you can use the Edit Menu of Microsoft Paint Brush to retrieve the image stored in the Clipboard. You can also press the Keyboard shortcut Ctrl + V with Microsoft Paint Brush in focus to paste the Clipboard Image to the Paint Application. Once you have pasted the screenshot, a dotted line will appear and indicate the size of the image captured. You can also examine the size of the image using the Attributes Menu Item of the Menu Image. The above screenshot displays Microsoft Paint Brush Application with Screenshot of a Windows Application. Note that the dotted lines indicate the actual size of the window captured using the keyboard combination Alt + Prt Scr button. Using Physical Keyboard for capturing Screenshot of Active Application Window can be really easy and fast to do. By default Paint Application of Windows XP stores the captured image in .bmp file format. While saving the Screenshot you can change the file type to anything available like .jpg, .png, etc. All the Screenshots in this website have been stored as .png files. PNG File Format uses minimum possible hard disk space without compromising the quality of the image. In case you have saved the images as .bmp file format or any other file format, you can use the Free Image Converter to convert Multiple Images to PNG or other supported file formats.